The Scarlettes are THRILLED to announce that we will be co-presenting a spring show with The Squares, a barbershop Quartet whom we met last year while performing during the In The House festival. 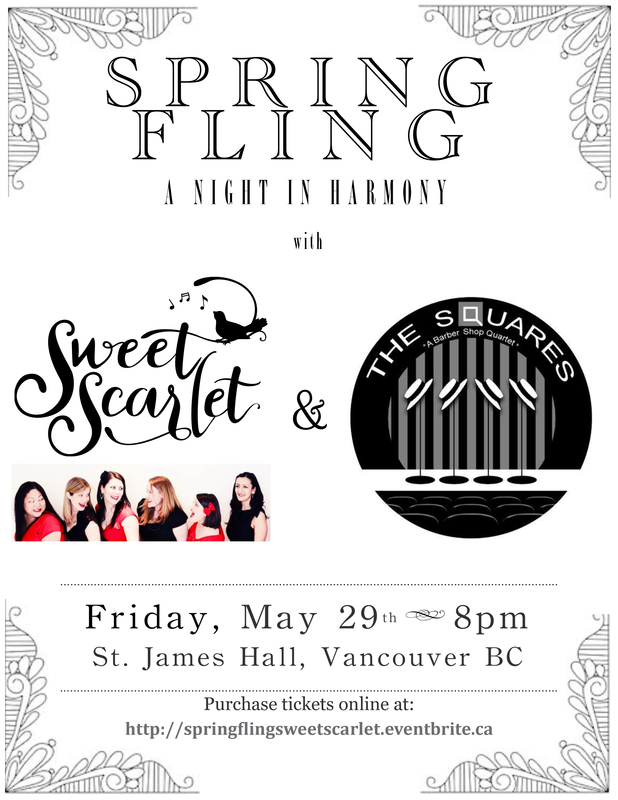 This Spring Fling “girl meets boy” a cappella performance is happening Friday, May 29th at St. James Hall in Kitsilano and tickets are limited so buy them early! We look forward to sharing brand new repertoire with you, as well as some joint pieces with the boys! Check out our poster for more information, or buy tickets here. And the 2015 excitement continued for the Scarlettes with our first TV spot on Vancouver Television helping promote the upcoming movie, Pitch Perfect 2. It was not a difficult sell since all the Scarlettes loved the original Pitch Perfect film, and we jumped at an opportunity to work with Vancouver Television. It was a lot of fun filming with Malaika Jackson with the direction of Harmon Bal and we hope to work together again!